Mary Richardson joined Peer Projects-Therapy from the Heart as Clinic Support Specialist in March of 2016. As a seasoned Executive Assistant/Office Manager with over 25+ years in the field, she brings extensive experience with all administrative tasks, including scheduling and correspondence, human resources and customer care. Having held positions in the business and medical fields, Mary is able to tailor her skills to meet the needs to various clients. As executive assistant, she has increased efficiency in several of her assigned roles, to include the development of a Customer Care Program, and Human Resource Department. As Office Manager for a small, family owned optical company; she was instrumental in setting up and organizing the customer database to ensure that day-to-day operations were efficient for customer satisfaction. Family is of utmost importance and having children of her own, she brings her compassion, patience and understanding to PPTFTH. She enjoys walking, reading and vacationing in Maine with her family. Donna Tassone joined Peer Projects-Therapy from the Heart as Clinic Support Specialist in May of 2017. She has 20+ years' experience in financial services consulting with a focus on project management, process improvement, customer service and administrative areas. As a consultant, she has traveled the country extensively providing services to a wide range of companies and individual clients to lead in the development of policies & procedures, documenting of business requirements, upgrading systems/software and organizing departments to gain efficiencies. Donna enjoys reading, traveling, live theater and music and is a volunteer with the American Red Cross. ​​Toni Belschner joined Peer Projects Therapy from the Heart as Clinical Support Specialist in January of 2018. With over 30 years of Administrative Assistant in Banking, Elderly Care Facility, City Hall as a tax collector and Physical Therapy in billing. Graduated from Fisher Junior College when it was an all girls college in 1985. She loves to help children in need and the elders where she was the Administrative Assistant in an Independence Living which she considered the residents as her aunts and uncles, given them lots of TLC when they needed to know that they were loved and needed someone to talk to. She is happy and grateful to Mary Lou and Linda for hiring her, which gives her an opportunity to work in a place that is compassionate and full of love to beautiful children. She enjoys watching TV, reading, trying new ethnic foods, loves to go to the North End in Boston, and loves to shop. ​Elizabeth Beaton joined Peer Projects-Therapy from the Heart as a Prior Authorization Specialist in September of 2018. She has 10 years' experience in customer service as well as clinical experience as a phlebotomy/lab tech. Working in a clinical setting has given her experience in patient care and extensive work around geriatric and pediatrics, being the higher volume of patients. She has a BA in English from the University of Massachusetts Boston; a degree that she hopes to put to use working in administration here at Peer Projects-Therapy from the Heart. Elizabeth enjoys reading, vacationing in Maine with family and spending time with family and friends. Nancy Ormiston joined Peer Projects - Therapy from the Heart in May 2017 as a Billing Specialist. She has brings 30+ years experience in financial services, grants management and community engagement. She is a graduate of Endicott College. She enjoys traveling with friends and spending time at the beach. Henry "Hank" Gagnon, IT Director is an Electrical Engineer who does consulting with telephone companies. Mary Lou. In his spare time Hank enjoys woodworking and reading. Paul Murphy, Accountant is a retired teacher in accounting and computer applications. 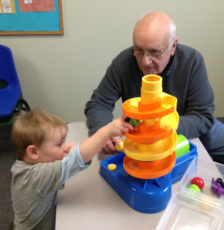 When taking a break from his role as "Grampy", he helps out at Peer Projects - Therapy from the Heart in numerous ways behind the scenes. Rob Pfischner, Technical Support helps us at Peer Projects – Therapy from the Heart with technology challenges from computer glitches to graphic design, when he isn’t at his day job, or supporting Linda, Freddie and Des. Matt Aubrey, Therapist Aide and All Around Help Matt graduated from Salem State University in May of 2016 with a degree in exercise science. He hopes to return to school in a year to earn his COTA/L and then go on to earn his OTR/L sometime in the future. He has previously worked in a hockey and lacrosse store and has a vast amount of knowledge on both. Matt feels he was lucky enough to get an internship here at Peer Projects Therapy From The Heart as it helped him discover that he wanted to pursue a career in pediatric occupational therapy. However, observing how well all the kids responded to Matt, Mary Lou and Linda knew they were the lucky ones, and offered him a job as a therapist aide before his internship was even finished! You can find him helping out in sessions and making sure everything is neat and organized. In his free time he enjoys watching and playing sports and also playing with his puppy Zeke.